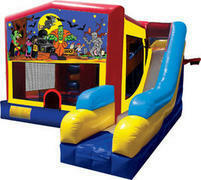 Need something to entertain the small kids, but have something more than just jumping to do for the older children?? Well here it is. 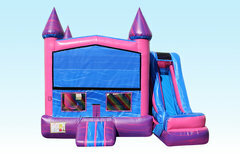 This unit has 2 different pop up obstacles, a climbing wall that leads out to an 8 ft slippery slide, a huge jumping area, a basketball hoop inside, as well as one on the outside for the parents or other children waiting! The Mesh windows gives a good inside view from the outside. This unit will go with any event you're having! If you need this exact combo with one of your themes of your choice on it, please see the others listed, or call to inquire. 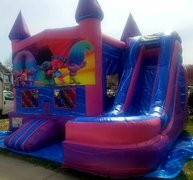 Combo Bouncer with Happy Birthday Banner on it. 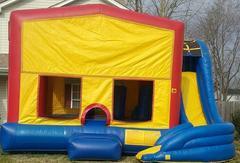 Inside it has the basketball hoop, large jumping area, 2 pop up obstacles,& climbing wall to the long slide. There is also a basketball hoop on the outside as well. 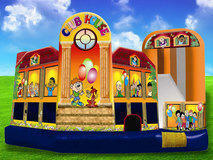 CAN ADD ANY PANEL/BANNER TO FIT YOUR THEME UNDER OUR PANELS CATEGORY. IF YOU DO NOT SEE YOUR THEME, PLEASE DO NOT HESITATE TO ASK US FOR IT. IT MAY NOT BE ON THE SITE YET. 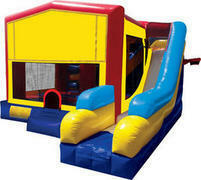 THIS COMBO COMES WITH A VERY SPACIOUS JUMPING AREA, BASKETBALL HOOP, STEPS, AND LONG SLIDE.